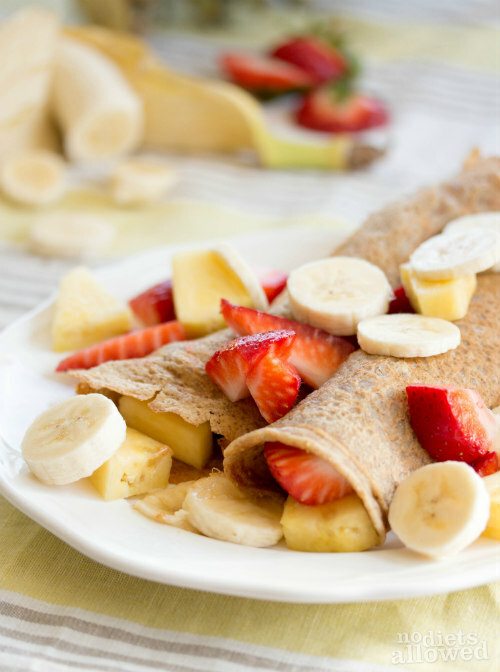 I have tried several vegan crepe recipes without success. They turned out either burnt or in one big pile of batter mess. Finally, I had success in creating the perfect crepe recipe! 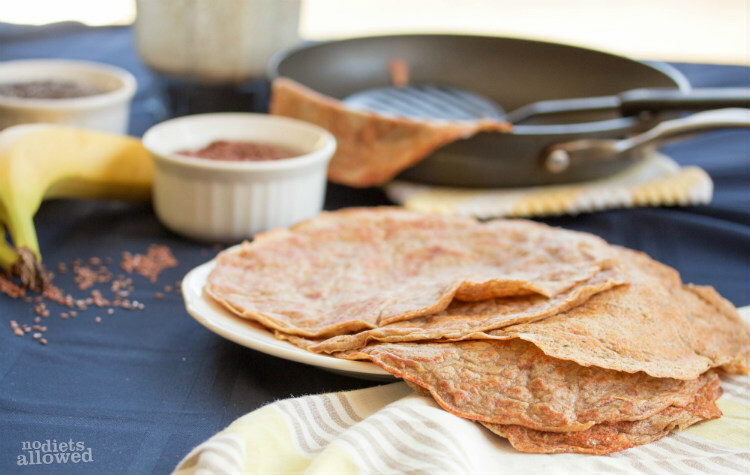 One tip for cooking vegan crepes is to cook on a low to medium heat. Also before flipping, the top should be bubbly and look dry. Oh, you’re going to fall heads-over-heels for these. It’s difficult creating vegan (no dairy milk or eggs or animal products) recipes. Eggs are especially important for binding the ingredients together. 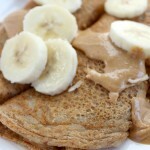 However, flax seeds, chia seeds, and mashed or pureed bananas are great egg substitutes! Also, these substitute ingredients have added nutrition and flavor. Extra bonus! Okay, I won’t keep you any longer. 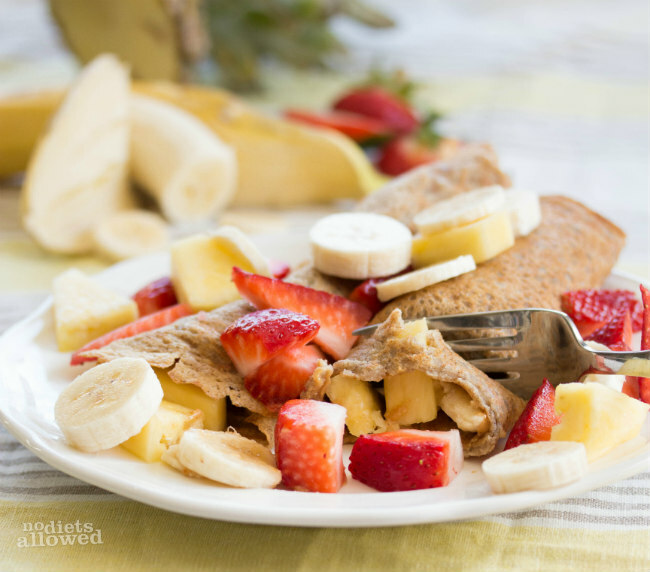 Enjoy these crepes with natural peanut butter, fresh fruit, and/or powdered sugar. Is your mouth watering yet? In a Vitamix blender, add ingredients in order listed. Blend on high for 30 to 45 seconds until batter is smooth and mixed well. In a skillet over low to medium heat, lightly spray cooking oil and pour about 1/2 cup of batter into center. Tilting the skillet in a circular motion, coat the bottom of the skillet evenly. Cook until top looks dry and slightly bubbly (approximately 2 minutes). Flip crepe over, press down lightly with spatula, and cook for additional 2 minutes. I’ve created several vegan and scrumptious breakfast options. 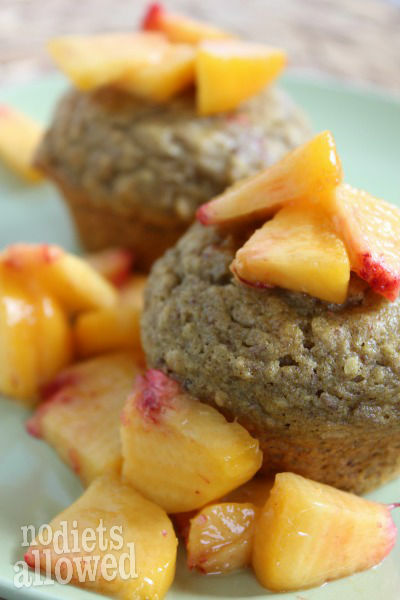 Check out these delightful muffins! Honey isn’t vegan, false advertising. I replaced it with maple syrup and I love this recipe. Thanks for your comment, Cece. I’m well aware honey isn’t vegan. I suggested organic agave for true vegans (maple syrup is also a great substitute). Many of my followers have sensitivities to dairy and eggs and not necessarily avid vegans opposed to honey. To accommodate for both groups, I put both options and allow you to choose. Yes indeed. That is me? I am not interested in vegan ism but have food sensitivities. I would add lamb’s blood if the recipe called for it (as long as the lamb was treated humanely) Thank you for broadening your appeal. Haha. Thanks for your comment, Phillip! This recipe tasted great! The only issue I had was with frying these guys. They stuck to the pan, even with diligent attention and low/medium heat as suggested. Could be my pan/ frying oil ( I only had coconut oil on hand). Anyway, I ended up baking them in the oven for 15 or so minutes @ 350 F and this worked great. Might be an option for anyone having that same issue. Thank you, Cassandra! This is a great suggestion. Thank you again for your input.